The readings this Sunday (the Fourth Sunday in Ordinary Time, Year A) feature the Beatitudes, a radical call to trust God. One of the hardest places to do that is in our spending habits. Don’t get me wrong. I do not wish to reduce the Beatitudes to our economic life only. But I do think that if we truly trust God in the way today’s readings say — if we believe that he is the eternal refuge described in the first reading and the source of all happiness as described in the psalm — that our economic life will have to change. Blessed are the poor in spirit, for they only spend what they have. We may complain about government overspending, but the truth is that many of us are not much better. We eat out more than we can afford to, buy more “toys” than we can pay for, fail to consult the budget we set up, and build a mounting pile of debt. This approach is the very opposite of “poor in spirit.” But if you spend only what you have, and only on what you need, you are indeed a man of beatitude. Blessed are the meek, for they will invest prudently. Get-rich-quick schemes have taken on a whole new meaning in the age of easy access to the stock market. Bold investments paid off for some — and led others to ruin. Meanwhile, those who put their money in careful, prudent investments sometimes gained, but at least fulfilled the lowest goal of investment: They at least got their money back. If your investments are in the “slow and steady wins the race” lane, and you are able to watch the hares without envy, you are truly meek — and strong. Blessed are those who mourn, for the bill for their party will be reasonable. Some of us live in a constant state of celebration. This comes from the “you deserve a break today” messages that advertising is eager to send and is far from the reflective, sober life of the beatitudes. It also costs more money. If you see life on earth as a temporary state filled with significance, and worth contemplating quietly, then you are living the third beatitude. Blessed are those who hunger and thirst for righteousness, for their money makes everyone’s life better. Jesus said that if we don’t help the poor, we will — literally — go to hell. He said it over and over and over. It’s true: Where you debt lies, there your heart lies also. Too often, we want to be generous to the poor with our money, but we can’t — because we have been too generous with our own desires. We profess Catholicism but live consumerism. That’s backwards. We should hunger and thirst not for the next awesome purchase — but for righteousness. Blessed are the merciful, for they will be forgiven as they forgive the debts of others. One translation of the Our Father says “Forgive us our debts as we forgive others.” No, forgiving your brother Bob the 50 bucks he owes you won’t make your credit card company decide to give you a pass. Mercy might actually cost you money. But a life lived counting pennies owed us will be a sadder, smaller life than one that is willing to be “penny foolish” and focused on friendship. If you learn to forgive money debts your heart will grow capable of greater mercy. Blessed are the pure of heart, for they look past the clothes to the person inside. Debt is not the only sign of a materialistic spirit. 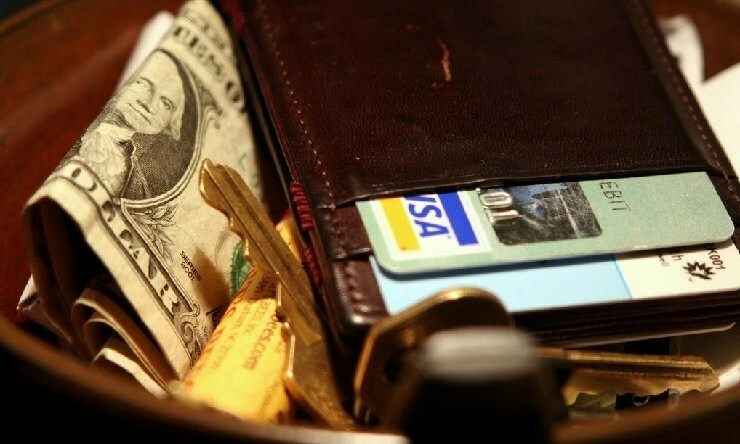 You can pay off your credit card every month and still be dependent on material possessions for your own identity — or your judgment of others. The pure of heart judge others not by their appearances or possessions, but by their dignity as creatures of God. Do we treat everyone the same — regardless what they are wearing, or driving, or have in their wallet? Blessed are the peacemakers, for peace costs less than war. Divided families learn what countries at war know: harmony is cheaper. The most extreme example is divorce, where spouses must maintain two households. But a household with several people pursuing several pastimes also costs money. Try peacemaking through family activities like game nights or movie nights. It’s cheaper and more fulfilling in the end. Blessed are the persecuted, for the culture of selfishness doesn’t recognize them. The decision to live the beatitudes with our wallet is a decision to be in one of those groups or the other.